The HyperX division of Kingston, which develops and releases computer memory and hardware components for enthusiasts, has announced a wide update of the Predator memory line. Interestingly enough, the update also includes the older DDR3 memory standard next to the latest DDR4 one so users of older computers will also be able to get a nice HyperX Predator update in case of need. 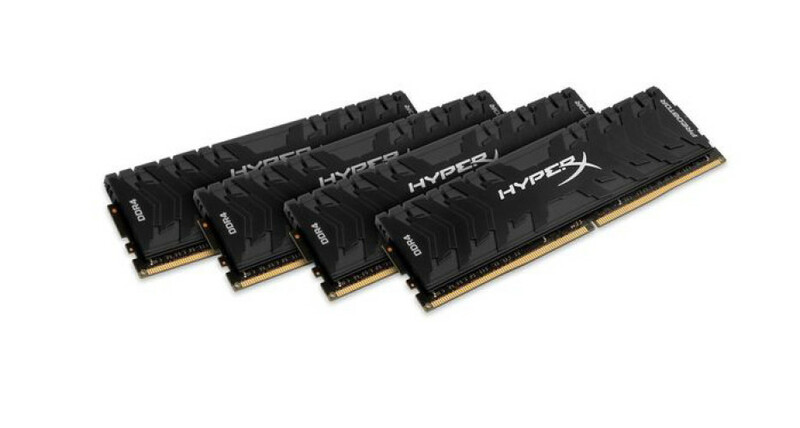 The new HyperX DDR3 and DDR4 memory comes in kits of two or four sticks and includes black heat spreaders and black PCBs. Kingston says the new DDR3 HyperX Predator memory is fully compatible with Intel’s Skylake processor (remember, the chip works with DDR3L memory as well). The new crop of DDR3 memory runs at 1866 – 2667 MHz and features capacities of 8 GB – 32 GB at latencies of 9-11 clocks and voltage of 1.5V-1.65V. As to DDR4 – the update includes modules that can run at 3000 MHz, 3200 MHz and 3333 MHz, capacities from 8 GB to 64 GB, latencies of 15-16 clocks and 1.35V of operating voltage. As usual a detailed price list is missing at the moment.